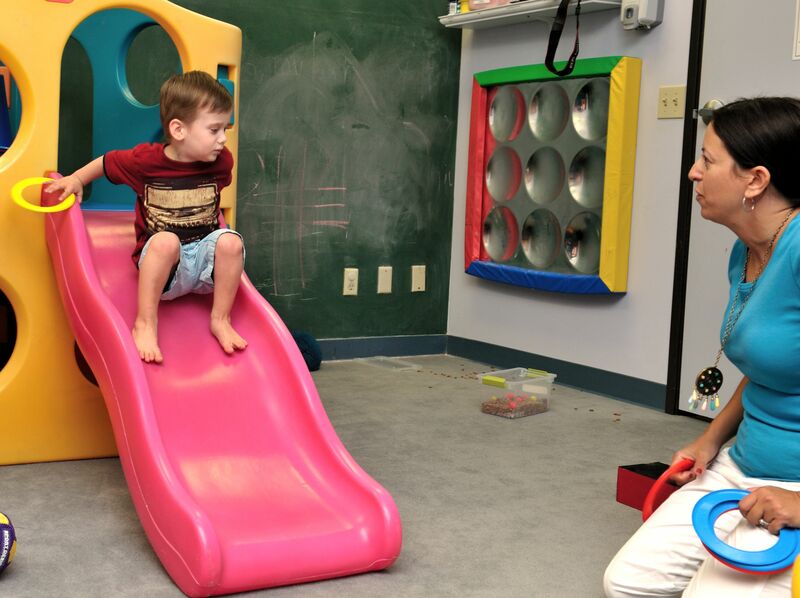 would be evaluated not only by the pediatrician, but also by a team of pediatric therapists specialized in child development and sensory integration. Imagine a child who does not crawl by the age of one. His parents may describe him as a calm child who likes to visually study the world around him rather than physically explore it. What about the toddler who bumps into things, or stumbles often? His parents joke that their little tyke is so clumsy, but his lack of coordination might be due to a poor body awareness, or difficulties in the sensory system, especially visual, vestibular (balance and spatial sense) or proprioceptive (registers force and where body is in space). How about the child who screams when he touches a viscous substance, such as liquid soap? Most parents, and doctors, would assume that this is just their preference or temperament, but an occupational therapist might see these behaviors as a red flag for sensory integration difficulties and/or developmental delays. When paired with developmental delays, sensory integration difficulties can amplify a child’s inability to meet his milestones. Our current system does not provide an easy and systematic way to screen all children at regular intervals. Parents might not realize that their child is struggling until years later when problem arise usually in school. Perhaps the child will struggle with social relationships on the playground, will be labeled as inattentive by a teacher, or will struggle academically. Children, especially the ones who show more subtle processing issues and developmental delays, too often can fall through the cracks. These delays can increase over time, making them even more challenging to overcome. Early intervention is essential to help support both children and caregivers. Screenings are essential to identify families and children who need support. CDI offers screenings, assessments and evaluations for young children in the community. We believe that every child should have the opportunities to thrive. If difficulties are caught early, therapists can help families and children overcome or improve them. Developmental screening are not meant to diagnose, but they do provide an overview of a child’s strengths and possible struggles. It’s a helpful way to bring awareness to issues that could possibly one day affect the child’s ability to thrive in a school, community or social environment. Assessments are in-depth and specific to a particular domain, such as speech and language, physical development, sensory processing, social-emotional (behavioral), and feeding. Evaluations are also very thorough, and assess a child’s overall performance and development. Therapists, through specialized observation and testing, can identify a disability or developmental delay. They look at the child’s language skills (both receptive and expressive), cognitive abilities, physical development, social-emotional development, self-help, and behavior. CDI routinely offers free developmental screening at our Early Learning Center. We are also available for more in-depth assessment and evaluations in all domains. Our services are designed to help children meet their full potential. Please contact us for more information. Perfection is a heavy burden for children to bear. It makes their thinking rigid and their ability to function erratic. It also fuels anxiety. A child who feels the need to perform perfectly at all times attaches her sense of identity on outcomes versus growth. Failure becomes an earth-shattering experience instead of an opportunity to learn. Many smart children are perfectionists. They have spent their lives being praised for their wonderful achievements and their natural abilities. The result is that they’re self-worth is often wrapped into their ability to wow people around them. Teachers and parents often pump them up with comments such as: “you’re so smart!” or “Another A! You’re such a great student!”. It makes them feel good in that moment, but unfortunately it does not show them the importance of struggling to learn, pushing past frustration, and persevering through difficulties. It teaches them nothing about being resilient, on the contrary it harms their ability to rise above adversity. These kids need to learn to embrace failures and risks. They often will avoid tasks that are challenging for fear of failing. They are risk averse, preferring the safety net of what they know themselves to be good at. They show what is referred to as a fixed mindset. Parents and teachers need to help them move away from their black and white thinking. They need to encourage a mindset based on growth and possibilities. Carol Dweck, a researcher and psychologist at Stanford University, recommends that adults praise the child’s effort, not her intelligence or grades. Children should also be taught how their brains work through difficult tasks, as well as how they can actively participate in their own intellectual growth. School work can be especially challenging for a child who feels the need to be the perfect student. Eileen Kennedy-Moore, PhD and Mark S. Lowenthal, PsyD in their wonderful book Smart Parenting for Smart Kids, make some useful recommendations for parents. Parents should step away- We parents, nowadays, hover over our children during homework time. This sends the wrong message to our children. Homework is their responsibility, not ours. It’s a contract between them and their teachers. Let them take ownership of it. It’s okay to provide structure- Although Moore-Kennedy and Lowenthal do not recommend parents sit with their children during homework time, they do suggest creating structure and expectations around the task. For example, she suggests enforcing no screen time until the child’s homework is done. Parents should resist the urge to correct their child’s work- How many of us have looked at our child’s writing and corrected the grammar or spelling? The impulse we have to correct their work sends the wrong message. It tells the child that mistakes are not acceptable. In addition, the teacher does not see what the child is capable of, and what she still needs to master. Encourage your child to try a different strategy- Does she understand the teacher’s expectations for an assignment? Does she have good study skills based on a variety of approaches (active learning, memorization, or planned learning increments)? Help her analyze her study skills and work habits. Often smart kids rely on their ease with academic tasks instead of good study habits. They might need help understanding what will work for their learning style. Teach your child to ask for help- Admitting that you don’t know something and asking for help is empowering. Yet, children who have perfectionist tendencies are more likely to avoid a task, or hide the fact that they cannot perform. They are afraid of what others might think of them, if they do not meet everyone’s expectations. Model asking for help and teamwork in your own life. Share stories with your children about collaboration and helping others succeed. Encourage your child to reach out and seek the help of others. Some children might benefit from a study group or partner. By the end of the summer, parents either look forward to or dread their children going back to school. The change of pace brings new challenges for families, especially if their children have sensory issues. With a little preparation, however, you can make this the best school year ever for you and your children. Allow for Down Time—Experts agree that children these days are too scheduled. Going from one activity to the next stresses a child’s nervous system and impedes healthy development. After a day at school, children need time to be inside their own heads, to pretend play, to explore their world, and to be creative on their own terms. Keep after school activities to a minimum and instead encourage your child to play with friends, to play alone, and to enjoy quiet time. One caveat, though, is that screen time should not count as down time. Studies show that the benefits of down time are negated by too much time in front of a TV, computer, or handheld device screens. Choose When Your Child Does Homework Strategically—If you want your child to do her homework without a fuss, you’ll want to prepare her for it. Make sure that you provide water and snacks after school. Then allow her to wiggle and move her body before you try to sit her down for homework. After a whole day sitting down at a desk, children’s brains need movement. Activities that allow them to push and pull on their joints are particularly beneficial. Jumping on a trampoline, climbing playground equipment, doing an obstacle course, or rock climbing will do wonders to prepare her for homework time. Only when her needs for movement have been met, should you attempt to sit her down to finish her schoolwork. Prepare for the Next Day the Night Before—Nothing ever goes as we expect. Prepare lunches, backpacks and clothing the night before. This way, you’ll increase the odds that you’ll leave the house on time and get the kids to school before the first bell. Enlist your children in this effort: With some guidance, they can help pack lunches and backpacks, and choose their clothes for the next day. Have a Firm Bedtime Routine—We talk a lot about the importance of sleep at CDI. More and more studies are coming out everyday showing how crucial sleep is to our development. Sleep helps solidify our memories, create new connections, integrate newly learned skills, and recalibrate our nervous system. It is needed at all levels of cognitive function, and physical rewiring and healing. Researchers recommend that a bedtime routine start with an early dinner (at least 3 hours prior to bedtime), no screen time (at least two hours prior to bedtime), as well as activities that help wind the body down, such as bath time, reading books, cuddling, gentle massage with lavender oil (if tolerated), or listening to soothing music. Once you find the nighttime routine that works best for your family, commit to it. Three Things that Went Well—when kids are tired they tend to focus on the negative. At the end of each day, always ask your child to list three things that went well. Of course this does not mean that your child cannot talk with you about things that might be bothering her at school, after all children need to know they can count on their parents for support. It’s just a technique used to help reroute our human tendency to get stuck on the negative at the cost of the positive. Make it a family event, where everyone in the family has to share their three things that went well. With these tips, your family should be off to a great start this new school year! CDI is always here to help you address any concerns you may have about your child’s development and wellbeing. Some children bite themselves or others when frustrated. I’ve seen a lot of this in children on the autism spectrum, but it can happen with any child–including those with sensory issues. Stopping this behavior can be quite a challenge for parents and caregivers. Let’s take a look at why children bite and what can be done about it. Often the biting behavior is not due to aggression but rather by an imbalance to the sensory system and poor self-regulation. Chewing and biting are sensory activities. They tap into the proprioceptive system that registers pressure in the joints. The resulting information goes to the brain for processing, which has a regulating effect on the nervous system. In other words, the child bites because he finds it soothing. Knowing this gives us clues to what we can do to address the child’s real sensory needs and reduce biting. 1. Jumping, pushing, lifting. Activities that place strong input on the child’s joint receptors will help lessen the need to chew and bite. Structure the child’s day, to make sure he gets to play on trampolines, does obstacle courses, and explores playground equipment. The more regular these activities become, the more they are likely to alleviate his need to bite himself or others. 2. Provide plenty of oral experiences. Games and activities that engage the oral muscles will go a long way to reducing biting. Try to have him blow bubbles, start with soap bubbles with a wand. Then move on to blowing bubbles using a big straw in a bowl full of milk or fruit shake. The effort needed to produce bubbles will help provide strong input to his brain. 3. Let him chew crunchy foods. Food items such as licorice sticks, carrot and celery sticks, pretzel sticks, crusty bread will provide great proprioceptive input. Some parents place a clean wet cotton rag in the freezer (make sure to wash the rag in non-toxic soap) for their child to chew on when he needs the extra input. If using food, always be mindful of the child’s food allergies, sensitivities and aversions. This should be pleasant and fun for the child. 4. Growling, mad faces, stomping feet and emotional play. Kids love it when adults enter their play or mirror their emotions. You can help your child by acting mad, and stomping your feet when he is frustrated. Tell him: “ I can see you’re frustrated. When I am frustrated I feel like stomping my feet, I growl GRRRR!” Mirror his face, so he gets validated and acquires a vocabulary around his emotion. Come up with more ways to mirror and educate your child about his emotions. 5. Pay attention to triggers. Changes in a child’s environment or interaction with others can impact a child’s nervous system. Stress reduces a child’s ability to react appropriately to a situation. The child has not yet acquired a toolkit to deal with his frustrations, new situation or sensory over-stimulation. Things like perfumes, lighting, crowds, or even lack of stimulation, can provoke the unwanted behavior in a child with sensory challenges. Parents and caregivers can look for patterns in their child’s environment to figure out what is triggering a melt-down or his biting. Often, an aggravating factor emerges. Figuring it out allows you to get to the root of the problem and fix it. A child who bites is sending a message about his boundaries, his nervous system and his needs. By looking at biting as a form of communication, we can address the underlying issues that make a child bite himself or others. Occupational therapists have many tricks in their toolkits, sensory and otherwise, to help reduce biting behaviors. May is Better Speech and Hearing Month. CDI’s speech therapists work with children and their families to improve communication, reduce auditory delays, and tackle oral-motor and feeding challenges. Parents often wonder what they can do at home to improve their child’s communication skills. Treasure hunt with words or pictures. You can do this around the house of garden. Keep it simple. Give your child some hints. When he finds a card, have him say the item written or drawn on the card while looking at you. Continue until all the cards have been found. This helps develop eye contact, communication, pronunciation and symbol or word recognition. Involve your child in activities of everyday life. Any interaction between parent and child is an opportunity to improve communication. Housekeeping, cooking, grocery shopping are all activities that a child can actively participate in. Talk through your process, and ask your child questions about what he sees or does. Public places I-Spy game. Parks, malls and beaches are all great venues for people-watching. Point out people, objects and actions you notice. Have your child take turns with you, and turn it into an “I-Spy” game. This activity will promote social observations, descriptive vocabulary and turn-taking. Tell Me What to Do. This game is fun for kids. Pick an activity your child knows how to do. Tell your child that you need to do the activity but you don’t remember how. He has to tell you exactly what to do. The activity can be a game you play, or an object you have to seek and fetch. Get him to give you detailed instructions. What’s that sound. This is a great listening game. Take turn making an animal sound and the other person has to guess what animal the sound belongs to. You can also cut out images from magazines of things and animals that make sounds and glue them onto little cards. These can be used as prompts for the game. Talk, Talk, Talk. When it comes to babies, experts agree that parents should spend time face to face with their child, talking and sharing the world in a descriptive and engaging manner. Babies love to have their sounds echoed back at them. It’s also important to speak about emotions. Children need to see their emotions reflected back to them, and they need to hear the words that explain how they feel. This simple technique can help them develop an emotional vocabulary and regulation. Swing and talk. If your child tolerates swinging, consider working on speech skills while he swings. You can sing the alphabet song. Face him so that there’s eye contact, every time he comes towards you say one letter, or take turns with him saying one letter at a time. You can do the same thing with songs like “Twinkle Twinkle Little Star,” counting from 0-10, or touching a part of your body that your child then has to name. Flashlight game. This is another favorite! Tape pictures or words (if your child reads) on a wall. Make the room dark. Take turn with your child holding a flashlight and lighting up a picture or word. Have your child say the word he sees. Bubbles. Children of all ages love bubbles! Therapists love them because it’s a fun way to work on many essential skills. Bubbles promote eye-contact through anticipation. It can be used to promote speech by making the child request more or telling you where he wants the bubbles. Teaching how to blow bubbles also works on your child’s oral-motor skills. We hope you’ll have fun with some of these activities. Speech, hearing and feeding delays are best addressed as early as possible. If you suspect your child has some speech, hearing or feeding challenges, please contact CDI for more information. Occupational Therapy, It’s Not Just Play! Occupational therapists love to come up with clever ways to help their young clients thrive. Tapping into a child’s motivation is the key ingredient in our recipe for therapeutic success. Our sessions can look a lot like simple playtime: your little one’s therapist may be on the floor playing with your child, or pushing him on a swing, or creating elaborate obstacle courses. But there’s a lot going on beneath the surface: the therapist is challenging your child’s sensory system, gross and fine motor skills, visual-motor coordination, balance, and self-regulation. Tunnels, stepping stones, bean bags, ball pits, giant tires, scooters, and ropes. Your little one leaps from one challenge to the next. It looks like so much fun. But behind the giggles, this activity helps your child in many important ways. Occupational therapists can play a key role in helping your child overcome developmental difficulties. They use play as a tool to build on your child’s strength and help him achieve his goals. Although therapy is purposely fun, it has a clear therapeutic purpose. Want to do some of our play activities at home with your little one? Check out our article on Cooking with Your Child, tips from an Occupational Therapist. Babies these days get a limited amount of opportunities to explore their bodies and their environment. Parents, rightfully, follow the APA guidelines for sleep positioning and place their little ones on their backs. Children also spend many of their waking hours strapped in devices such as car seats, strollers, or bouncy chairs. This can unfortunately delay development and increase muscular imbalances in growing bodies. Tummy Time has been shown to promote development, and is recommended by The American Academy of Pediatrics. It involves your baby spending time on his tummy while supervised and engaged by you or other caregivers. It has been shown to promote development in several areas. Promotes gross and fine motor skills. Provides opportunities to build strength against gravity. Provides weight bearing opportunities for forearms, hands, elbows. Lengthens important muscle groups in the hips, abdominals, trunk and neck. Promotes arch development in hands (necessary for fine motor skills). Increases sensory input to joints and organs (proprioception), and vestibular (our body’s positioning sensory system). Promotes sensory and neurological development. Increases opportunities to bond and connect with caregivers. Increases opportunities for exploration and autonomy. Research shows that to help your child reach developmental milestones he should participate in 90 minutes of tummy time per day by the age of 4 months. If you have not started yet, or are nowhere close to that goal, don’t fret. Just start where you are at and slowly increase the duration. At first, you might want to break down this activity into small increments spread throughout the day. Start early: while lying on the floor or bed, position your newborn infant on your tummy, promoting eye contact and closeness for a few minutes at a time everyday. Make sure you support his head. It’s okay if your baby fusses a little. Always stay with your baby during tummy time. Start in small increments of time, such as 30 seconds. Increase it little by little. Try to distract your baby with interesting visuals. This will help increase his tolerance for this activity. Make it part of your daily routine (e.g. do tummy time after each diaper change). Read books while your baby is on his tummy. Place your baby in front of mirror while in prone (tummy) position. Get your older kids to do tummy time with your baby. It’s good for them too! Parents and siblings are a baby’s biggest motivator, so get on the floor with him. Encourage eye contact & communication, sing songs, and be playful. Occupational therapists and early intervention therapists are very creative when it comes to tummy time. Reach out to your CDI team for more ideas and on how to incorporate tummy time into your baby’s daily routine. Relationship building takes time and effort. Parents must work hard at developing a strong and dynamic relationship with each of their children. Our children grow and change with each new stage of development, which challenges us to adapt to new rules and circumstances. Strong parent-child relationships, however, have certain qualities that remain constant. They are built on safety, unconditional love, mutual respect, acceptance and flexibility. Safety is at the core of bonding and self-regulation. It starts when a newborn infant’s needs are met by his parents. He learns then that his parents are consistently there for him, providing food, warmth, comfort, love and stimulation. Through these interactions, a trust is built that will last a lifetime. It forms the solid ground of the parent-child relationship and the child’s emotional wellbeing. Unconditional love is a direct result of the trust that was built. Children need to know that that love will not falter through their ups and downs, and that their parents will always be there to support them emotionally no matter what. They need to feel that failures do not dictate whether they are worthy of the love they receive from their parents. Parents can nurture this quality by being emotionally available for their children, trusting them to explore their world, and allowing them to learn from mistakes. Parents often feel that their children should respect them. The respect needs to be reciprocal. Children need to know that their opinion, feelings, and rights matter. Respect starts with good communication. When you truly listen to your child’s needs and let him know that he is being heard, you are showing respect to your child. When you acknowledge his individuality, even when it differs from yours, you are letting him know that you respect who he is. When you set clear expectations and provide explanations and guidance when they are not met, you are reinforcing the mutual respect between you and your child. When you expect him to treat you with kindness, and you show him the same consideration, you are fostering a relationship based on mutual respect. Acceptance is an open-ended concept. It means embracing your child’s individuality, meeting him where he is at, and cherishing his unique qualities. It also means accepting his limitations and flaws while gently helping him through hurdles. Flexibility means accepting that your child tomorrow might be different from who he is today. Only the child he is in that moment can guide your approach and your parenting. It also means parenting mindfully with an understanding that nothing in raising kids is ever set in stone. Techniques that work for someone else’s child might not work for our own children. Parents always have to adjust their parenting with the evolution of their child. When something does not work we keep looking for possible solutions. We should stay open to new approaches and possibilities. The parent-child relationship is a complex one. A solid foundation can help make it stronger with each stage of child development. 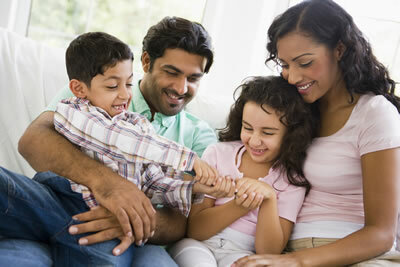 CDI’s therapy team is well versed in parenting techniques and creative approaches. We can help you find parenting solutions uniquely tailored to your child and your family’s needs.